Allied Precision Heated Pet Bed, Natural, Medium, 28" x 28"
Provide the warmth and comfort your pet deserves with the Allied Precision Heated Pet Bed. 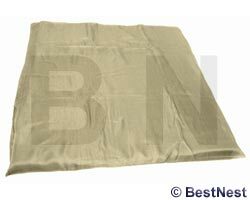 The washable, zippered cotton canvas cover fits easily over the 28" x 28" foam bed that protects an easy to clean, plastic 17" x 17" heating element. The 72" durable cord is covered with a spiral wire which performs as a chew protector. This heated pet bed is low voltage for safety and low wattage for economy. Intended for indoor use, this pet bed helps keep your pet off furniture by providing a cozy, heated bed perfect for chilly garages and basements. Surround your aging, spoiled, or favorite medium sized pet in gentle warmth with the Allied Precision Pet Bed. One year limited warranty. Allied Precision Heated Pet Bed, Green, Medium, 28" x 28"
Allied Precision Heated Pet Bed, Maroon, Medium, 28" x 28"
K&H Thermo-Bed Heated Pet Pad, Green, Medium 29" x 26"